I am from rural Henan province, which is more than 600 miles away from Beijing. I have been working in the capital for 17 years now. 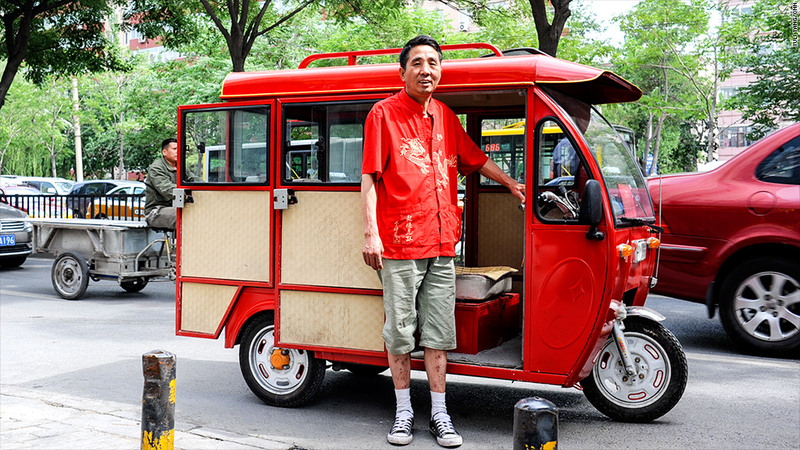 I used to sell vegetables and lunch boxes, but now I do rickshaws rides in central Beijing. I work from six in the morning to eight in the evening, seven days a week. I make about 100 yuan ($16) a day. My rickshaw business is actually illegal, so if the police catch me, I could be fined as much as 2,000 yuan ($320). My Chinese Dream is to earn enough money to buy a house for my son in our home town. Buying a house here in Beijing is impossible for me, even if I save every penny that I earn in my entire life. Video: What is the Chinese Dream?